Yes, I found a few as well...glimpses of warmer days and bigger blossoms. 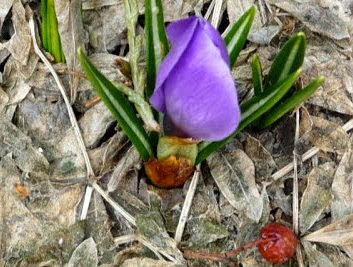 I have no crocuses, though I do have grape hyacinths and daffodils. And I did think of promises... Sweet post and sweet new look here. it's true spring does remind one of the resurrection...I found many wildflowers blooming in our barren desert hills today-will blog about them tomorrow with photos. Vee, I love grape hyacinths and daffodils too. Our daffys come up later... always think of Wordsworth's poem on daffodils this time of year. Penny, I can only imagine that you can already plant your tomatoes, basil, etc. How lovely to think it. Not sure why, but Canada is experiencing the toe-dragging of Spring across the country. Delisa, how lovely to find your comments... all the way from Georgia! Lin, there is something most beautiful about wildflowers in barren desert hills. I've never seen it in 'real' life, only in photos. I think I like their courage to bloom in such a seemingly unlikely spot. Gives us courage to do the same when we find ourselves in such a barren space. So true! I am so lucky to live where the weather is mild much of the time; I've had roses in bloom for awhile and other flowers are popping up everywhere. It's such a thrill to see color in the yard again. Thank you so much for stopping by and leaving such kind comments. I hope you have a happy Easter weekend! 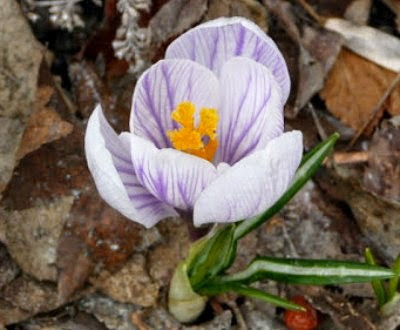 I had a crocus (one) and a few dismally small and limp daffodils show themselves a week or so ago. They are gone, and nothing in their places. Just way too much rain here and not enough sunlight, I surmise. Wishing you an blessed Resurrection Sunday and Easter season. He lives! How wonderful to see some colour!! Not even a peek of a hardy dandy over here. 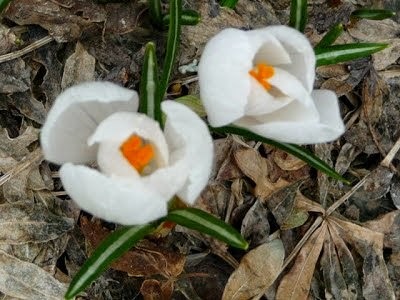 Maybe I'll have to plant some crocuses this year.